Making money online, from the comfort of your own home or office, seems too good to be true. However, there are many people making a successful living doing it. Whether your goal is to grab some passive income ideas or to escape the rat race, our list of ways to make money online should provide you with some great ideas to get moving towards your financial freedom. And don’t forget to read our master article covering over 100 ways to make money. Online Surveys – Every year, public opinion seems to get more important for companies and therefore online surveys become a more popular option for those looking to earn some money online. Whether it is testing new products or simply answering a few questions, you can earn up to $5 for simple surveys and more for others. With a simple search online, you will find a number of companies offering money for surveys. Just pull up your browser of choice and type in “money for surveys” to see what is currently available. Market Trading – Just because the internet is relatively new, it doesn’t mean that you have to find a new way to make online money. For many years, people have been trying their luck on the markets and this is still true today. Recently, eToro and Plus500 have been popular as they both allow free practice accounts. In truth, millions of people use these apps and you could make money after spending some time learning how it all works. Review Websites – When companies set up new websites, they need to know what works as well as what doesn’t. Therefore, they will hand access over to third-parties who look for people like you and I who will review the site for money. Normally, you will have to record your screen and maybe even your voice with a microphone as you navigate the site and make comments as to what is good and what could be improved. Check out one such site called User Testing. Disney ‘Vault’ – Of all the greatest movies of all time, it’s fair to say that quite a few of these will come from Disney. As a result, Disney is famous for restricting supply on their ‘classics’ before then releasing them to the world once more. With this in mind, you can normally purchase them during these periods before selling them on when supply has been restricted and pocketing a nice profit. Admittedly, this is very much a long-term way to make money online but it is something to consider whilst also looking at the other tips in this list. Write a Book – Nowadays, it is incredibly easy to get a book published because Amazon have a program entitled ‘Kindle Direct Publishing’. With this, you can write your very own book and have it made available on the Amazon store. Of course, this doesn’t mean that you will instantly become the next J.K.Rowling but a little marketing could see your book sell. Make an App – With the majority of people in the developed world now owning some form of smartphone, you could target specific niches with an app. Nowadays, this task is actually very simple and even affordable. As long as you produce something that people want or need, you could earn a good income both now and in the future. Use Fiverr – As businesses continue to strive for efficiency in this ever-more competitive world, many are choosing to outsource tasks to freelance workers. Essentially, Fiverr is a hub where buyers and sellers come together and you can become a seller if you have specific skills to offer. For example, you might be able to complete simple administrative jobs or even provide a voice-over for a potential ad. In truth, there are numerous opportunities for everyone on Fiverr from singing to writing, logo design to whiteboard animations. Email Marketing – If you really want to make some money online, email marketing will be one of your best bets as long as you are interesting and unique with your approach. Seeing as though this is one of the rising techniques, you will need to be consistent and hard-working with this one. You can check out indeed for a list of jobs in this field. A few basic job requirements are planning email content, coordinating with the production team, A/B testing campaigns, customer service help, and building list segmentations based on customer behavior and email engagement. Buy/Sell Products – In the short-term, you can sell items in your home for money on sites like eBay. However, this isn’t exactly a long-term solution because you will soon run out of things to sell while living in an empty room. Therefore, you can move over to the buying side of the market and find products that will be easy to sell. As long as you have buyers ready, you can find a supplier without having to worry about holding huge amounts of stock. Drop Shipping – Leading on nicely from the previous point, you could become middleman between buyer and seller in terms of drop shipping. Every year, many manufacturers look for people who can find buyers for their products and you can take control of this process. Setting up a website or social media pages, you can sell these products on the manufacturer’s behalf. Again, no stock will be necessary because the company can send the product straight to the end destination and you can keep a percentage. If you want to learn more, stop by shopify for a free weekly webinar. Blogging – Since the introduction of the internet, there has been people giving their own opinions in some form or another. Over the past decade, this has been in the shape of blogs and you could now find a blog on every topic you could think of including kettles, cats, sports, fashion, knitting, minimalism, positivity, and more. With blogging, there are a number of routes that you could take to earn money online. First, you could make your own products and sell them on your own blog; this will require a strong following. Second, you could join an affiliate program and advertise for other companies on their behalf. Third, you could get to a point where you have a good following and then sell advertising space. Affiliate Marketing – As mentioned above, affiliate marketing is a great way to make money online and having a blog or website is an easy way to do this. However, there are other ways to join an affiliate marketing program including through social media sites and even just using emails. As long as you have a following in some way, these affiliate marketing programs will allow you to use a link for which your readers or followers can use. When someone makes a purchase through this link, you will receive a percentage as commission. Airbnb – If you have a spare room or even a whole property that goes unused whilst you attend business trips or go on vacation, you could earn money online by renting these out to others. With sites like Airbnb, everything can be handled online and you can receive a contribution towards your rent or mortgage whilst the property isn’t in use. Click Working – Back to ideas that allow you to make money online from your sofa, click working has become popular of late and these sites mean that you can earn money for small tasks. When companies have small tasks that can be time-consuming or threaten to take employees away from more important jobs, they will outsource them to sites like ‘Clickworker’ and this is where you can make money. From web research to data entry, these simple tasks will earn you a nice income. Review Music – Of all the art forms in the world, music is perhaps the most popular and you would struggle to find someone who doesn’t like at least one style of music or artist. If you have a passion for music, you can turn it into an earning opportunity by using sites like Slicethepie. For new artists, they will place their music on the site for people like us to come along and give them a rating. At first, earnings can be small but a reputation can soon be built and earnings can increase. Freelance Anything – So far, we have discussed sites like Fiverr that allow you to choose a skill and make some money from this. However, it is also important to note that it can be rewarding to go it alone. Although it can be hard at first with no reputation, this will soon build and you can offer your freelance services as a writer, designer, online support worker, website designer, and more. Competitions – Before you dismiss this idea entirely, it could be a good way to earn some money on the side whilst trying another idea on this list. Across the web, you will find a number of sites that display many competitions that are currently ongoing from the largest companies. As strange as it sounds, there is a group of people called ‘compers’ within the UK who claim to make up to $50,000 every single year. Domain Trading – Again, this one may seem a little out of the ordinary but there are people making money from buying and selling domain names. As long as you spend a little time researching, you will be able to turn a quick profit from popular names. Normally, the money will be made from trends and other names that have commercial value. Online Tutoring – With an added pressure on young people to gain their qualifications as a means to a better future, many parents are setting their children up with online tutors in order to improve their learning opportunities. If you have extensive knowledge in a particular subject, you can set up a profile on tutoring websites and gain a reputation. As your reputation builds, you will have more customers. As well as making you money from wherever you reside in the world, this can also be rewarding. Language Tutoring – In a similar vein to the previous suggestion, there are many people looking for online language tutors. As long as you find a reliable website, you can help people in their journey to perfecting a second language. Since we seem to have less free time now than previously, a significant portion of students have taken their search online which is where you come in and make a difference. Sell Stock Photos – Although this will require you to take a camera wherever you go and take some high-quality images, the majority of the work is done online. Ultimately, you could spend one week traveling around your area taking images and then uploading them for the world to see. If you manage to capture a couple of world class shots, people will be happy to pay for them once they have been uploaded to istockphoto, photodune, and the like. Whenever you leave the house, take your camera and you just might strike gold with a magical sunset. Peer-to-Peer Lending – As the name suggests, this is an activity that sees people lend money to others in need as opposed to them going to the bank; perhaps the bank isn’t even an option for them. After lending money to someone, interest will build and you will receive a larger amount in return. Seeing as though this requires minimal effort, you could do this whilst also trying other tips we have here today. Check out our Lending Club review for more. Video Testimonials – As long as you have a camera and can read from a script, this could be a great idea for you. For businesses, credibility has become a key factor for a brand and, as a result, they have started to pay people to record a testimonial for their company or products. Normally, you will be sent a script to learn and you simply have to sell the words while recording yourself. If you are a good actor, there is no reason why you can’t receive regular work. YouTube – Alongside blogging, YouTube is perhaps the biggest method for earning money online and it is a method that has exploded somewhat in recent years. Although it does require a personality or even just interesting videos, there is huge potential for earnings. Much like blogging, there are numerous ways to make money from YourTube. On the one hand, you could place ads on your videos and earn money per view. On the other, there is an opportunity to combine your YouTube channel with affiliate marketing and sponsorships. Etsy – If you have a creative streak, Etsy can be a superb place to let it show. Many people earn a living online on Etsy. Just like you would in a physical store, Etsy allows you to create a storefront for all the products you can create. Then, you can post ads to the world and appeal to potential buyers. Although there are now thousands of people on the site, it is still possible to stand out as long as you are offering something unique and professional. Amazon FBA – Considering Amazon is now the world’s largest online retailer, creating a partnership or at least getting involved with them in some way seems to be a good idea this year. With ‘Fulfilled-by-Amazon’ (FBA), you can sell to the world whilst having Amazon worry about the storing of products and then shipping when orders come in. With a little market research, you can find products that will sell well and make a tidy profit. Create an Online Course – When it comes to online income, this is one of the strongest at the moment because people are always looking to invest in themselves. With sites like Udemy, you can create an online course which can then be bought by anyone who is interested in the topic of the course. For example, you could create a course explaining how to use social media for marketing. As you can imagine, this will take a little investment at the very beginning but, as long as you have a high-quality end product, you can earn good money from this activity both now and in the future. Virtual Assistant – For some, organization comes naturally while, for others, it is an impossibility. If you are the former of the two, you could help the latter in business by offering a virtual assistance service. As long as you can use Microsoft Word, Excel, PowerPoint and the like, you could help businesses from home. Over time, you can build up a list of clients and increase your prices until you reach a comfortable salary. Buy Profitable Websites – Finally, you might think that paying for a website sounds rather silly but it can make you a fortune. Think of websites as real estate of the 21st century. One of the easiest ways to make money online is to buy an existing and established website that already makes money! Brokers like Quiet Light Brokerage provide vetted websites for sale that are proven money makers. You’ll obviously need some money for this, but a lot of banks are now offering loans which makes this an easier way to make money online. After finding a site that gets a good amount of traffic, you can place your own ads and join affiliate marketing schemes. If the site is getting good attention, people will click through and you will see commission for very little work. Flippa is another great website that offers users a platform to buy and sell websites. Invest in Websites – As well as finding websites for sale online, you can also invest in a website which gives the owner some capital to grow and expand. If the risk pays off, you will see a return on your investment. Become a Key Figure – Recently, we have seen people selling cookbooks, recipes, workout regimes, and all things similar. Why? Because they are more organized than the vast majority of the public. Rather than creating their own recipes or workout regimes, people would rather look to people for help and this is where you come in. Why not organize a cookbook and healthy eating diary and sell this to others? Eventually, you can become a personality on social media and YouTube as well as having a blog! Amazon Mechanical Turk – Once again, we return to Amazon and for good reason. On ‘Mechanical Turk’, you can find all sorts of micro tasks such as correcting spelling errors, finding items from a catalog, looking for keywords, translating a small piece of text, and more. With this, you can choose which jobs you apply for, what hours you work, and you will be associating yourself with the huge name of Amazon once more. Online Travel Agent – Have you ever found yourself searching the net for travel ideas just for fun? Now, you can turn this into an online money-making idea and offer your advice and services to holiday-makers. Nowadays, people are looking for a cheaper way to go on vacation than through a traditional travel agent. From home, you could advise people on the best deals and take a commission if they accept. Matched Betting – In essence, this is actually very similar to trading the markets and it is a little more reliable than simply betting on sports games or in a casino. Rather than betting on the outcome of a single event, matched betting requires you to guess the movements of the market in the lead up to said event and throughout as it takes place. Nowadays, you will find a number of tutorials and websites providing tips for how this is done. Note: matched betting is currently illegal in the U.S. Product Reviews – Sometimes, companies like to have a good amount of reviews on certain products. In fact, some are willing to actually pay for people to leave reviews and you could be on the receiving end of this. On some occasions, you will be sent a product to test but other times you will be paid outright to write a review and leave it on a website. Freelance Reselling – Earlier, we discussed the opportunity to sell certain skills on sites like Fiverr or even going it alone. However, there could even be a chance to resell these skills and act as a middleman without having to do any of the work yourself. For example, you could have someone approach you for some logo designing work. Then, you give this work to a designer while keeping some of the profits for yourself. As long as you are organized and have a good amount of reliable contractors, this can be extremely profitable. Research – On apps like FieldAgent, you can get paid for simply carrying out small research tasks for others depending on your location. Although some sites will require you to leave the house and check something in your local area, others you can complete from your home. For example, you could be asked to compare the price of an item from ten different online stores. Of course, the earnings for one job might be small but you can do well with multiple jobs per day. WordPress Themes – If you have looked into blogging before, you will have heard the phrase ‘WordPress themes’ and these are the designs that people use on their very own blogs. Since there is heavy competition in the blogging market, everyone is looking for unique designs while being willing to pay a lot of money at the same time. If you can create a theme that looks good, you could make $50 per sale. 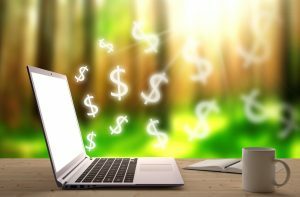 Why is a life insurance agency writing about making money online? The reason a life insurance agency (TermLife2Go) is writing about making money is because one of the most common thing we hear from would be clients is “I can’t afford life insurance“. However, all you have to do is compare the lowest rates on life insurance out there and you will find that coverage is a lot less than most people think. But even if it is out of your budget to get a policy, by pursuing one of these money making ideas you can get some extra cash flow to be able to afford that policy that you and your family so desperately need. Previous Post: Qualifying for Life Insurance after Being Diagnosed with Leukemia. Next Post: Qualifying for Life Insurance with Esophageal Varices.